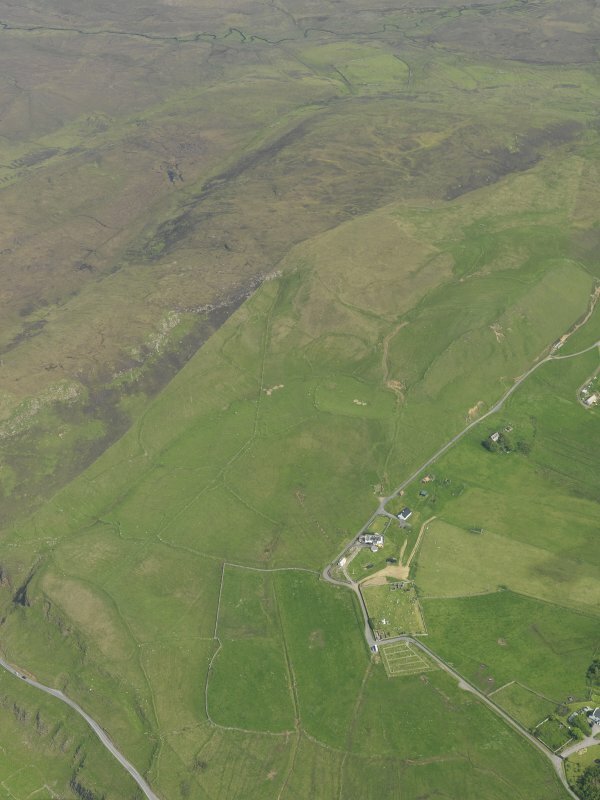 General oblique aerial view looking across Kilmuir and the Flora Macdonald monument, taken from the WNW. Kilmuir Graveyard on site of 16th century parish church, enclosed by rubble wall of 1832 . Memorial to Flora Macdonald, Alexander Ross, 1880, replacing gale-ravaged original of 1871. A dignified Celtic cross of granite, rising some 28 ft above her tomb; inscribed marble plaque added 1922 . Maclean Burial Enclosure, with lintel inscribed 1793 on weathered moulded doorpiece. Upper Duntuilm (the former Kilmuir Manse, also known as the Lodge of Osmigarry), 1776/8; substantial additions by James Gillespie Graham, 1803. From 1931 the home of author and naturalist Seton Gordon (1886-1977), who added an extension.